Dry granulation is used in the pharmaceutical industry to improve powder flow by increasing their granular particle size. This is accomplished by using a roller press, which can be configured for different granule size and quality. Roller compaction has a significant effect on the properties of granules and their suitability for tablet production . The technique involves pressing powders together under high pressure to produce larger granules. Two pressure rollers squeeze the powder to make a ribbon of material of uniform thickness and density, which is then passed through a low-shear mill. The method is used widely in drug manufacture to produce solid dosage forms of high quality. Regulating roller compaction is essential to control granule properties. Maintaining a uniform density across the ribbon allows granulates with a more uniform particle size to be produced. Altering limits, such as the feed-in speed of the powder, the speed of the roller itself and the nip angle of the rollers to the ribbon, also allows the granulates properties to be fine-tuned. In this way, the granules can then control other product properties such as porosity, flowability, homogeneity, compactability and compressibility in the final product. These factors are essential as they influence dissolution profiles, disintegration times, and hardness of the final solid dosage form. To control roller compaction, accurate measurements are required for the granulate products. The relative density or Solid Fraction is a crucial control parameter that determines the optimal setting for speed, compression and nip angle in the roller compactor. Using Solid Fraction data allows consistency from batch to batch, as well as an end- product with the designed and desired performance. Accurate measurements of volume and density can be difficult to achieve as the material has an irregular structure as well as pores. Three different definitions of density of a porous material are required, each requiring different techniques for measurement . Absolute density is obtained when the volume measured excludes both the pores within particles and the spaces between particles in the bulk material. A gas pycnometer, is the fastest and most accurate technique to use as the helium used quickly and thoroughly fills the smallest pore spaces. This method can be used on solids of all shapes and sizes, and the technique is recognised as one of the most reliable for obtaining volume and density. Envelope or bulk density includes the pore spaces in the volume measurement. 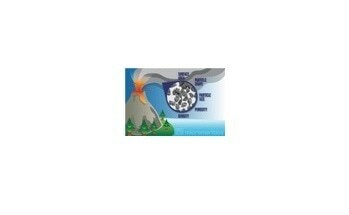 The method here makes use of a free-flowing dry powder as the displacing medium. Solid fraction can then be calculated by dividing the envelope density of the ribbon by the absolute density of the granule. Tap density is obtained from filling a container with the test material and vibrating it so that the particles settle into the best packing arrangement. The measurement depends upon particle size distribution and shape as well as the technique. Micromeritics has two automated helium pycnometers instrument ranges (GeoPyc and AccuPyc) to determine each of the three different types of density. The GeoPyc range measures envelope density using Dry Flo, a quasi-fluid composed of small, rigid spheres with a high degree of flowability. The sample is placed in a bed of Dry Flo which is then agitated. The Dry Flo particles form an 'envelope' around the sample; and are designed to conform closely to the surface of the object but not invade its pore spaces. 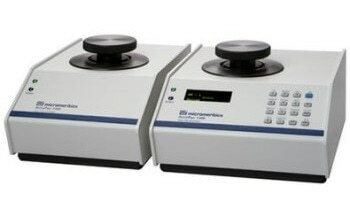 The GeoPyc 1365 is the newest Micromeritics instrument in the range. With an intelligent touch-screen for control and reporting functions, the instrument can also provide tap density measurements . 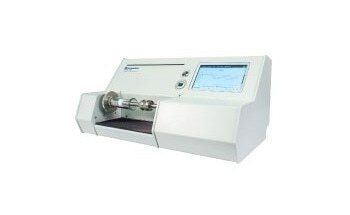 The AccuPyc II pycnometers provide high speed and high precision absolute density measurements. This instrument has been designed to provide temperature stability and accurate temperature control for all temperature-sensitive samples. This is important because although gas pycnometry provides reliable density measurements, temperature can have a major effect on volume (expansion) and affect accurate density determination. The AccuPyc II TEC offers temperature stability and accurate temperature control from 15-36⁰C (adjustable by 0.1⁰C). 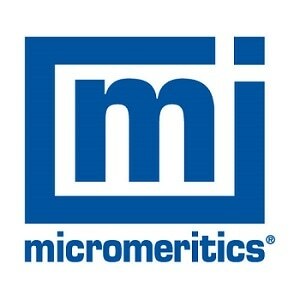 Micromeritics range of gas pycnometers allow the, reliably and accurate, control of roller compaction processes. Each range is designed to provide the pharmaceutical scientist with the ability to measure a range of essential parameters and keep tight control over their compaction operations.